The European aerospace consortium EADS has unveiled its electric airliner, the E-Thrust, which could radically transform commercial aviation by 2050. 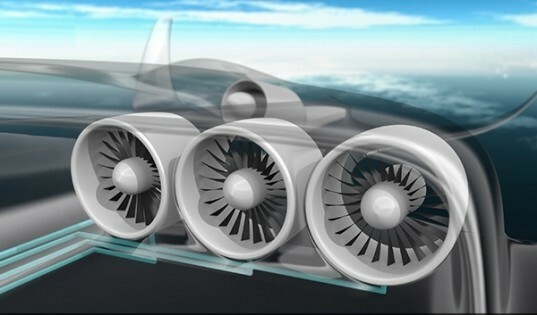 Developed in partnership with Rolls-Royce to increase the efficiency of future airliners, the E-Thrust concept is a hybrid electric propulsion system that could slash fuel consumption, emissions and noise. All if this has been incorporated into one design called the eConcept. As part of the ‘Flightpath 2050’ plan produced by the European Commission, the continent aims to reduce aircraft CO2 emissions by 75%, along with reductions of Nitrogen Oxides (NOx) by 90% and noise levels by 65%, compared to standards in the year 2000. That is where the E-Thrust comes in. The gas plant powers the fans directly, though the battery can be charged to power an emergency landing should the gas system fail. A sleek airframe design also allows for reduced weight and drag by decreasing the size of the vertical tail and improving weight distribution. There are also rumours that EADS could present an all-out electric airliner completely covered in solar panels in a few years. That would make commercial flying completely renewable.